"3 Easy Payments of $29.99"
Hear more of the vocal stylings of Richard Simmons in a tribute to the troops called "Piece of My Heart." 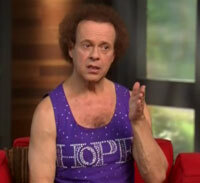 See the 1996 classic in which Richard Simmons tells men at a shopping mall to come up and shake their booties! See why David Letterman's talk show wasn't the best place for Richard to promote his Steam Heat steamer. At least it’s slightly more subtle than strapping on a medieval cod piece. Is that T-shirt available in different verbs? Deal-a-Meal gave him the opportunity to travel the country in a powder blue 1957 Chevy convertible and ambush unsuspecting grocery shoppers by ramming into their shopping carts. In Farewell to Fat Richard appeared before hundreds of screaming fans at a suburban shopping mall where he promised to help a weeping woman before promptly losing her telephone number. Sweatin’ to Live took place on his annual “Cruise to Lose” in which fat people are punished for their obesity by being forced to spend their vacations with Richard Simmons. The Move, Groove & Lose infomercial, set in the Apollo Music Cafe in Harlem, let Richard fulfill his lifelong dream of dancing around with five beefy black men in tuxedos. The infomercial for Project HOPE, on the other hand, is a fairly standard mix of interviews, demos, and testimonials. Yet this infomercial has one thing that is definitely unique. 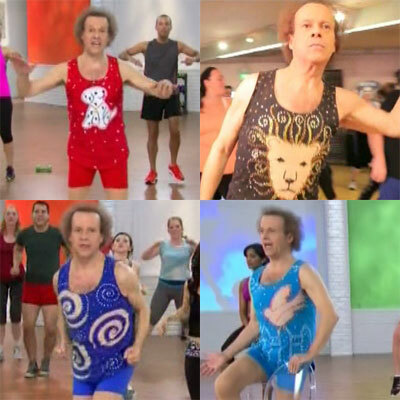 The songs used in the workout videos indicate that Richard’s taste in music has been updated, but not improved, since his “Sweatin’ to the Oldies” days. The tunes include “Born this Way,” “Evacuate the Dance Floor” and “Need You Now.” But they also include “original songs written and sung by Richard himself.” Wisely, this infomercial includes only 3 seconds of one of these songs. It is titled “Let It Slide,” which sounds like an earnest plea for someone to use more lubricant. 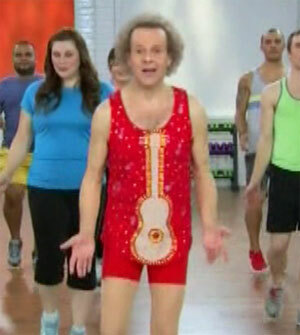 Don’t miss the upcoming album in which Richard Simmons performs duets with other equally accomplished singers such as William Shatner, Rebecca Black, Leonard Nimoy, and William Hung.